Toxins come in two forms – external and internal. An overload can lead to a myriad of health conditions such as fatigue, bloating, poor digestion, poor skin, body odour, bad breath and even depression. Although your body is designed to naturally eliminate toxins daily, it can become overburdened. According to drbenkim.com, your body increases its output through the eliminative channels if your exposure to toxins rises. Your eliminative mechanisms cannot keep up with the number of toxins that are coming in and being generated in your cells, and they can become problematic to your health if you accumulate enough of them. Therefore, it is vital that we support our body’s self-cleansing system to prevent the day-to-day build-up of toxicity. 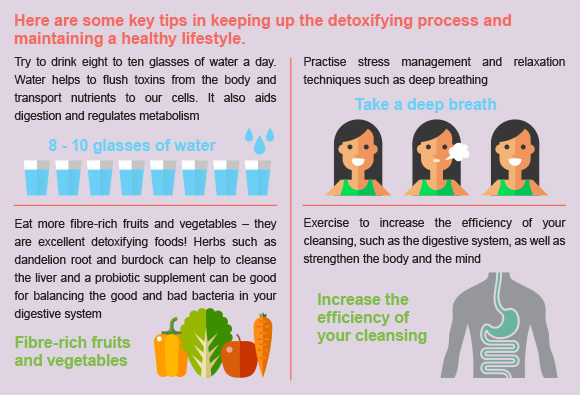 The first step in detoxification is to limit the toxins that act as obstacles to the process, such as alcohol, coffee, cigarettes, refined sugars and saturated fats. On life.gaiam.com, stress is also singled out as a ‘deterrent to good health. In large amounts they create toxins and slow down detoxification enzymes in the liver.’ It recommends yoga as one of the simple and effective ways to relieve stress.